This was another audiobook from Audible.com. The recording was high quality and well-performed. This was a cast recording instead of a single narrator, and that format typically isn't my favorite because the interactions don't seem all that great. This time, however, the cast worked really well with each other, and the multiple-narration wasn't distracting at all. In addition, there were some musical transitions. These tend to annoy me, because the editing of the music itself and its insertion as transition are typically handled REALLY poorly, making me want to saw my ears off with the spoon with which I'd just gagged myself. This time, I was very pleasantly surprised that the music was well done, well edited, and facilitated sensible transitions between narrative sections. 4.5 out of 5 stars for the audiobook performance. For the book itself, I liked it but it didn't knock my socks off. For some reason, I expected more science fiction out of it. It tells the story of a group of young adults that are being tested for survivalism on an unknown, but Earth-like, planet. The test is supposed to last from two to ten days, but something (predictably) goes wrong. The rest of the book is about the "natural" results of the "something's gone wrong" event. 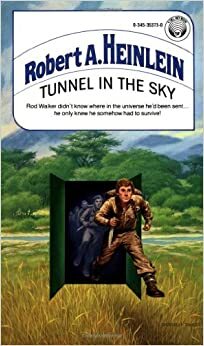 3.75 out of 5 stars for Tunnel in the Sky as a novel.